They didn’t start out as environmental warriors. Clair Patterson was a geochemist focused on determining the age of the Earth. Herbert Needleman was a pediatrician treating inner-city children. But in the chemistry lab and the hospital ward, they met a common enemy: lead. It was literally everywhere-in gasoline and paint, of course, but also in water pipes and food cans, toothpaste tubes and toys, ceramics and cosmetics, jewelry and batteries. Though few people worried about it at the time, lead was also toxic. 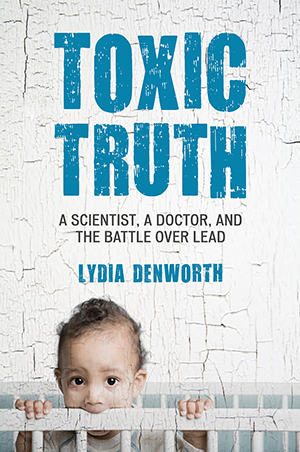 In Toxic Truth, journalist Lydia Denworth tells the little-known stories of these two men who were among the first to question the wisdom of filling the world with such a harmful metal. Denworth follows them from the ice and snow of Antarctica to the schoolyards of Philadelphia and Boston as they uncovered the enormity of the problem and demonstrated the irreparable harm lead was doing to children. In heated conferences and courtrooms, the halls of Congress and at the Environmental Protection Agency, the scientist and doctor were forced to defend their careers and reputations in the face of incredible industry opposition. It took courage, passion, and determination to prevail against entrenched corporate interests and politicized government bureaucracies. But Patterson, Needleman, and their allies did finally get the lead out - since it was removed from gasoline, paint, and food cans in the 1970s, the level of lead in Americans’ bodies has dropped 90 percent. Their success offers a lesson in the dangers of putting economic priorities over public health, and a reminder of the way science-and individuals-can change the world. The fundamental questions raised by this battle-what constitutes disease, how to measure scientific independence, and how to quantify acceptable risk-echo in every environmental issue of today: from the plastic used to make water bottles to greenhouse gas emissions. And the most basic question-how much do we need to know about what we put in our environment-is perhaps more relevant today than it has ever been.